Each winter on courses throughout the country, greens become brown or white and water hazards turn to ice. 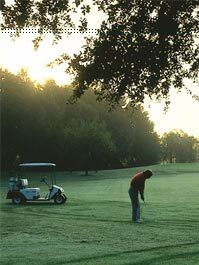 But here at in Leesburg, the sun shines year 'round on our 18-hole championship golf courses. So if your clubs get dusty or your game rusty, you can't blame it on winter. While challenging the more seasoned golfer, The Plantation's two well-groomed courses provide a relaxing and picturesque golf experience for less skilled players as well. Ask about other area semi-private courses, including one by Arnold Palmer! Stop by our clubhouse, where you'll find a well equipped golf shop and two PGA professionals on staff. Learning the game of golf is a journey that has no end. We all struggle with the same elements at one level or another. As a golf professional, I've discovered that a simple tip here or there can make a big difference in most anyone's game. I've gathered those tips that help most golfers enhance their skill level and enjoyment. Every month, I'll try to have a fresh one for you. Enjoy.